Through this write-up, we have provided current affairs quizzes which have been created from the events recently happened in the month of February 2017. 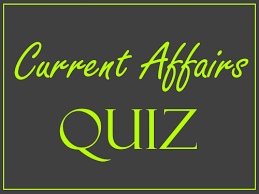 Such current affairs quizzes are very important for IAS Prelims Exam 2017 preparation. It is very important to study current affairs, one of the crucial sections of the IAS Exam. To study current affairs for IAS Prelims Exam and IAS Mains Exam requires a sincere and continuous practice on a daily basis from an IAS aspirant. Here, in this article, we have provided current affairs quizzes based on the events happened in the month of February 2017. I. “India Innovation Index” will rank states on Innovations through country’s first online innovation index portal that will capture data on innovation from all Indian states on innovation and regularly update it in real time. II. The India Innovation Index Framework will be structured based on the best practices followed in Global Innovation Index (GII) indicators and additionally by adding India-centric parameters those truly reflect the Indian innovation ecosystem. III. This initiative will be the point of reference for all international agencies to collect India’s up to date data points for global indices and analytic. The India Innovation Index Framework will be structured based on the best practices followed in Global Innovation Index (GII) indicators and additionally by adding India-centric parameters those truly reflect the Indian innovation ecosystem. This initiative will be the point of reference for all international agencies to collect India’s up to date data points for global indices and analytic. I. Mahila Shakti Kendra will be set-up at village level in 14 lakh ICDS Anganwadi Centres. This will provide one stop convergent support services for empowering rural women. II. Under nationwide scheme for financial assistance to pregnant women Rs. 6,000 cash will be directly given to the pregnant women. The Union budget 2017 is committed towards more welfares schemes for woman and children. For the welfare of Women and Children under various schemes across all the Ministries the allocation has been stepped-up from Rs.1,56,528 crores in BE 2016-17 to Rs. 1,84,632 crores in 2017-18. Mahila Shakti Kendra will be set-up at village level with an allocation of Rs. 500 crores in 14 lakh ICDS Anganwadi Centres. This will provide one stop convergent support services for empowering rural women with opportunities for skill development, employment, digital literacy, health and nutrition. Under nationwide scheme for financial assistance to pregnant women Rs. 6,000 each will be transferred directly to the bank accounts of pregnant women who undergo institutional delivery and vaccinate their children. 3. India attained which of the following rank globally in installed wind power capacity? As per the Economic Survey 2016-17, India has attained the fourth position globally in installed wind power capacity after China, U.S. and Germany as a result of various steps in the “right” direction. With the legal framework in place for the International Solar Alliance (ISA), the brainchild of Prime Minister Narendra Modi and launched during the UN climate summit in Paris, ISA will be a “major” international body headquartered in India. The Economic Survey also specifies that currently, India’s renewable energy sector is undergoing transformation with a target of 175 GW of renewable energy capacity to be reached by 2022. In order to achieve the target, the major programmes on implementation of Solar Park, Solar Defence Scheme, Solar scheme for Central Public Sector Undertakings; Solar Photovoltaic (SPV) power plants on canal bank and canal tops, solar pump, solar rooftop among others have been launched in recent years. I. It is proposed to create a Payments Regulatory Board in the Reserve Bank of India by replacing the existing Board for Regulation and Supervision of Payment and Settlement Systems. II. The board would look at interoperability of digital transactions and facilitate competition and innovation among financial technology companies in the payments space. III. It will also be responsible for consumer protection, decide on penalties and create appeal mechanisms, which could ensure faster resolution of disputes over settlement of digital payments. The government, keen on promoting digital payments, will form a separate regulator for the payments industry to resolve disputes, ensure customer protection and check any foul play by dominant players. The Union Finance Minister has called for an overhaul of the Payment and Settlements Act 2007 to create the Payments Regulatory Board. He said the board would be under the Reserve Bank of India (RBI). This is being done to avoid criticism that the board would dilute the banking. It is proposed to create a Payments Regulatory Board in the Reserve Bank of India by replacing the existing Board for Regulation and Supervision of Payment and Settlement Systems. The board would look at interoperability of digital transactions and facilitate competition and innovation among financial technology companies in the payments space. It will also be responsible for consumer protection, decide on penalties and create appeal mechanisms, which could ensure faster resolution of disputes over settlement of digital payments. 5. Recently, scientists have used CRISPR Variant technology to produce tuberculosis-resistant cows. Which is the main technique used in CRISPR technology? Clustered regularly interspaced short palindromic repeats are segments of prokaryotic DNA containing short, repetitive base sequences. Each repetition is followed by short segments of spacer DNA from previous exposures to foreign DNA (e.g., a virus or plasmid). Small clusters of CAS (CRISPR-associated system) genes are located next to CRISPR sequences. The CRISPR or CAS system is a prokaryotic immune system that confers resistance to foreign genetic elements such as those present within plasmids and phages that provides a form of acquired immunity. Researchers used a novel version of the CRISPR system called CRISPR/CAS9 to successfully insert a tuberculosis resistance gene into the cow genome. A simple version of the CRISPR/CAS system, CRISPR/CAS9, has been modified to edit genomes. By delivering the CAS9 nuclease complexed with a synthetic guide RNA (gRNA) into a cell, the cell's genome can be cut at a desired location, allowing existing genes to be removed and/or new ones added.